You’re sitting at your desk at work when you suddenly hear a loud crash and the sound of breaking glass. You run out to the hallway and find an injured coworker lying on the floor, a large piece of glass stuck in her leg. She tells you that a large glass vase shattered and pierced her calf. 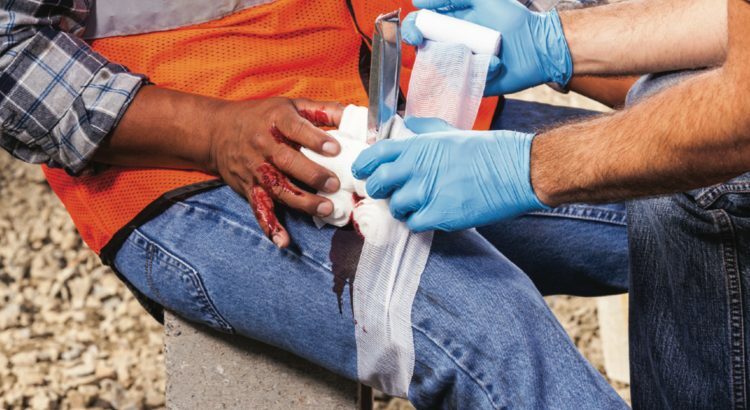 An penetrating injury occurs when an object enters the body, causing a wound. Sometimes the object will remain stuck in the body. For example, a large piece of glass, wood or metal might be seen sticking out of the wound. Here’s the #1 rule: Do not remove the impaled object.. Pulling out the object can damage nerves and blood vessels and make the wound much worse. Call 9-1-1 and get your first aid kit. 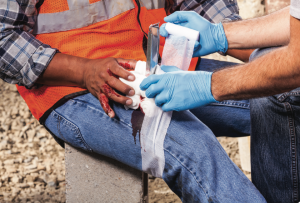 Apply plenty of gauze or pieces of clean cloth around the embedded object to begin to control blood loss. Place additional bulky dressings around the embedded object to stabilize it in place and prevent it from moving around. Monitor the patient for signs of shock and treat accordingly. If the object falls out on its own, apply direct, firm pressure to the wound. The outline above is not a substitute for formal CPR First Aid instruction. Please visit www.frontlinehealth.com for more information on taking a full First Aid CPR AED class.